The three French workers had been held hostage by al-Qaeda militants for six months. 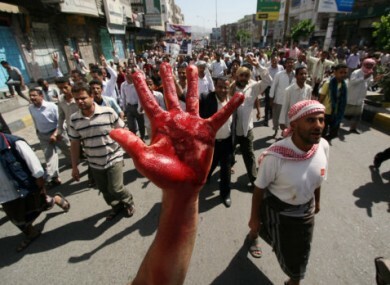 Meanwhile, demonstrations continue (pictured) against the country’s president, Ali Abdullah Saleh. THREE AID WORKERS who were held captive by al-Qaeda for six months have been freed. They were freed thanks to help from the sultan of Oman and a possible ransom payment, officials said today. The kidnappers were linked to al-Qaeda’s offshoot in the region and had demanded $12 million in exchange for the three workers. They had threatened to kill them if the ransom wasn’t paid imminently. The hostage ordeal came amid an uprising against the 30-year reign of President Ali Abdullah Saleh that has unraveled security in Yemen, the Arab world’s poorest country. The aid group Triangle Generation Humanitaire said the three workers were in good health. A senior Yemeni tribal mediator said the Omani government and a Yemeni businessman paid a ransom, though he gave no figure and the ransom could not be confirmed. The mediator said Oman and Yemeni tribesmen negotiated the release, and that the hostages were handed over to mediators one by one. He said a helicopter carried the hostages from the southern Yemeni city of Shabwa – a hotbed of Islamic militants – to Oman late on Sunday. The state-run Oman News Agency quoted a Foreign Ministry official as saying that Oman helped find the hostages because of its “distinguished relations” with France. The two women and one man from Triangle Generation Humanitaire were abducted on 28 May in eastern Yemen’s Hadramawt province, which is home to al-Qaeda in the Arabian Peninsula. “We know they are in good physical shape,” a director of the group, Patrick Verbruggen, told The Associated Press. Abdu al-Janadi, a Yemeni government spokesman, told reporters on Sunday the hostages were held by al-Qaida militants in Shabwa and that the abductors threatened to kill the hostages if the Yemeni government didn’t pay a ransom by the end of the week. Email “Aid workers freed in Yemen ”. Feedback on “Aid workers freed in Yemen ”.